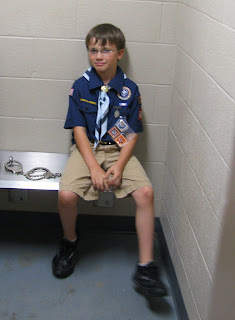 I never thought I'd see the day when one of my sons would be fingerprinted and put in a holding cell. But then again, I was the oldest of six girls. We weren't involved with Cub Scouts who tour police departments! I see a page coming . . .
That is so funny! Great pics! praying for surgery day for you! The pp's just look so yummy....remind me a bit of Bo Bunny. I just love what you have done with them too.